Contextual advertising is the practice in which an ad-serving tool matches the advertisements based on the content that appears in the blog. For example, a blog about candy would have ads for candy, and a blog about movies would show ads for upcoming films. If the website visitors are interested in the content of the website, they’re likely also interested in goods and services related to the topic of the website, and thus they’re more likely to click the ads. The first major player in the contextual advertising game was Google AdSense. The program was popular from the start, and after a few rocky periods of users abusing the system, it has proven to be quite a moneymaker for successful bloggers. Many professional bloggers make their living almost entirely on the income received from Google AdSense revenue. 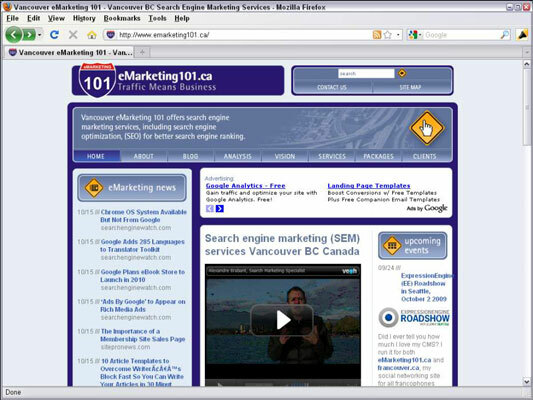 Search-engine marketer Alexandre Brabant uses Google AdSense on his company website, eMarketing 101. The Google AdSense program ads appear below the navigation bar of his site.